The Kosača family was a Bosnian medieval noble family which ruled over parts of modern Bosnia and Herzegovina, Dalmatia (in southern Croatia), Old Herzegovina (in western Montenegro) and Raška (in southwestern Serbia), between the 14th century and the 15th century. The land they controlled was known as Hum (Zahumlje), roughly corresponding to modern region of Herzegovina, which itself was derived from the title "Herzog", which Stjepan Vukčić Kosača adopted in 1448. The family ruled as vassals to several states, including the Kingdom of Bosnia and Ottoman Empire. The Kosača family members belonged to the Bosnian Church, Catholic Church and Serbian Orthodox Church. The family name Kosača was probably taken after the village of Kosače near Foča, in the Podrinje region of eastern Bosnia, where the Kosača family were originally estate owners. The founder, Vuk (by which the family is also called Vukovići), was a prominent military commander under Emperor Dušan the Mighty of Serbia (r. 1331–1355) who took part in the conquests of southern Balkans. He was given lands around Upper Drina. Vlatko Vuković, the son of Vuk, brought the family to prominence after taking part in battles against the Ottomans. He commanded the victorious Bosnian army at the Battle of Bileća (1388). At the Battle of Kosovo (1389) he commanded the left flank of the Serbian army led by Prince Lazar of Serbia, with troops that were sent by Bosnian King Tvrtko I. The battle was at first reported as a victory, also by Vlatko himself, however it has been concluded as inconclusive, with a long-term Ottoman victory. Stjepan Vukčić Kosača in 1448 dropped his title "Vojvoda of Bosnia", assuming the title "Herceg [Duke] of Hum and the Coast". He changed it again in 1449 to "Herceg of Saint Sava" in recollection of the Serbian Orthodox saint. This title had considerable public relations value, because Sava's relics were consider miracle-working by people of all Christian faiths. The Kosačas themselves, however, were one of the few non-Orthodox noble families in Hum. His lands were known as Herzog's lands or later Herzegovina. King Stjepan Tomaš of Bosnia married Katarina Kosača, daughter of Stjepan Vukčić, in a Catholic ceremony in May 1446 ensuring, at least for a short while, he had the support of the most powerful nobleman in the kingdom and a staunch supporter of the Bosnian Church, Stjepan Vukčić. 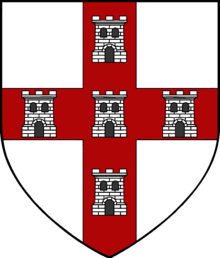 Coat of Arms of the "Vuković", from the Fojnica Armorial (18th century). Zagrađe Monastery, Serbian Orthodox monastery built by Stjepan Vukčić Kosača. Serbian Orthodox Church of Saint George in Sopotnica near Goražde, founded by Duke Stephen in 1454. The Goražde printing house worked at this church between 1519 and 1523, producing books in the Serbian recension of Church Slavonic. The memory of Queen Catherine (Katarina Kosača), who was beatified after her death, is still alive in Central Bosnia, where Catholics traditionally mark 25 October with a mass in Bobovac 'at the altar of the homeland'. Some of the artifacts belonging to the Queen and the Kotromanić family were taken in 1871 by Josip Juraj Strossmayer from the Franciscan monastery in Kraljeva Sutjeska to Croatia for safekeeping until 'Bosnia is liberated'. They have never been returned. ↑ Fenomen "krstjani" u srednjovjekovnoj Bosni i Humu: sbornik radova by Franjo Šanjek, 686 Pages, Published 2005. ISBN 978-9958-9642-5-1, p. 266. 1 2 3 4 Др. Жељко Фајфрић, Београд, 7. децембар 2000, Котроманићи: "Како су Санковићи сишли са политичке сцене тако се почела издизати породица Косача. Њихово исходиште јесте негде око Фоче где се налазило село Косач, по коме су, могуће је, добили име. Родоначелник ове породице јесте Вук Косача, али породица захваљује свој успон његовом сину Влатку Вуковићу. Он је био од самог почетка један од најповерљивијих људи краља Твртка I. Ишао је у многе преговоре као његов представник, победио Турке код Билеће 1388. године, водио босанску војску на Косову 1389. године, и још доста тога што га је уздигло у односу на остале. Напад на Санковиће била му је и последња акција будући да је већ следеће године (1392.) умро. Наследио га је Сандаљ Хранић, син његовог брата Храње Вуковића. Осим земаља и утицаја, наследио је Сандаљ од стрица Влатка и титулу војводе. У то прво време Сандаљ Хранић нема одлучујући утицај у Босни, будући да су испред њега Павле Раденовић и Хрвоје Вукчић, али његово је време долазило." 1 2 Miller, William (1921). Essays on the Latin Orient. pp. 508–509. Retrieved 2011-02-26. ↑ Thynne, Roger (1924). The churches of Rome. K. Paul, Trench, Trubner & co., ltd. p. 154. Retrieved 2011-02-26. Fine, John Van Antwerp (1994). The Late Medieval Balkans: A Critical Survey from the Late Twelfth Century to the Ottoman Conquest. University of Michigan Press. ISBN 978-0-472-08260-5. ISBN 0-472-08260-4. Fine, John Van Antwerp (1975). The Bosnian Church: a new interpretation: a study of the Bosnian Church and its place in state and society from the 13th to the 15th centuries. Tomović, Gordana. Oblasni gospodari u 14. veku (PDF) (in Serbo-Croatian). p. 2. Serbian Patriarchy (1965). Serbian Orthodox Church: its past and present. Pavle Ivić (1995). The history of Serbian culture. Porthill Publishers. Lukovic. Заједничка граница области Косача и области Бранковића јужно од реке (PDF). Balcanica (in Serbian). Arheološko društvo Jugoslavije (1968). Arheološki pregled (in Serbo-Croatian). 10-11. p. 96. Др. Жељко Фајфрић (7 December 2000). 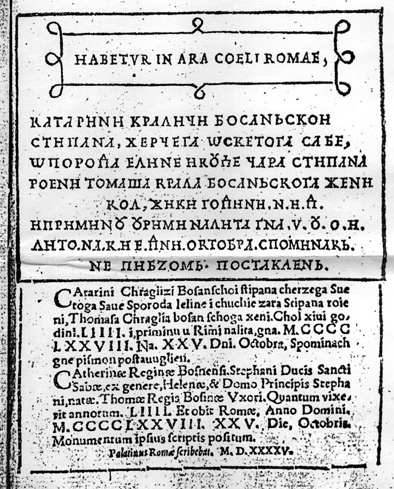 Котроманићи (in Serbian). Београд. А. Ивић: Родословне таблице српских династија и властеле, Нови Сад 1928. Дио Сандаљевог депозита за побочну грану племена Косача, У: Српска проза данас : Косаче оснивачи Херцеговине / Ћоровићеви сусрети прозних писаца у Билећи, Научни скуп историчара у Гацку ; [приређивач Радослав Братић]. - Билећа : Просвјета ; Гацко : Просвјета ; Београд : Фонд "Светозар и Владимир Ћоровић", 2002, 261-268. Родоначелник племена Косача – војвода Влатко Вуковић, У: Српска проза данас : Косаче оснивачи Херцеговине / Ћоровићеви сусрети прозних писаца у Билећи. Научни скуп историчара у Гацку / [приређивач Радослав Братић]. - Билећа : Просвјета ; Гацко : Просвјета ; Београд : Фонд “Светозар и Владимир Ћоровић”, 2002, 243-260. Споредна грана племена Косача, У: Зборник за историју Босне и Херцеговине 3 (2002) 61-77. Учешће Косача у ослобађању Јајца од Турака 1463. године, У: Српска проза данас : Косаче оснивачи Херцеговине / Ћоровићеви сусрети прозних писаца у Билећи, Научни скуп историчара у Гацку / [приређивач Радослав Братић]. - Билећа: Просвјета; Гацко: Просвјета; Београд: Фонд "Светозар и Владимир Ћоровић", 2002, 464-475.